This is a Banksy that LJ took a picture of in Brighton. Very cool. Don't worry Jen I'll be posting some of yours soon! Now I had some advice this week about the Graffiti Submissions. There's a website called picturesofwalls that is full of Graffiti. Much of it is utterly hilarious and I've been a fan of the site for ages. I could upload pics from their and post them as submissions but that would, for me anyway, kind of screw with the integrity of the Blog and not be very fair on those that have managed to send in submissions. However, the site is awesome and it's worth sharing some of my favourites with you, but they will be under a different heading. So here's my current favourite from picturesofwalls. Once again, keep them coming. Best thing to do is mail them to me at diaryofaledger1@googlemail.com or post them on twitter as a flickr link so that I can get them at a decent size and resolution. And I promise I won't cheat and use ones from picturesofwalls as an actual submission. If it's not it's definitely a stencil copy. A lot of his work is copied. 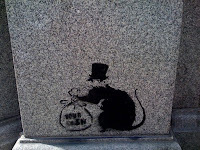 The one I took in Southsea of the Rat is a copy of a Banksy in London.